The first Canadian stop on the Cochon555 tour was held in Banff, Alberta over the weekend and I was graciously hosted by the folks at the Fairmont Banff Springs and Banff Lake Louise Tourism so that I could attend this dramatic chef’s competition featuring locally raised Heritage Breed pigs. Could there have been any better reason for a sunny weekend away in Banff? As a farmer’s daughter I know all too well that it is often difficult for farmers to leave their farms, even for a few days. Just days before the event Christopher and Jessica Fasoli of Bear and the Flower Farm had to deal with the overland flooding overtaking their pig paddock and pastures. They worked tirelessly to ensure all their Duroc/Landrace/Berkshire pigs were moved to higher ground (much to the chagrin of the pigs!) and safely out of harm’s way. The life of a farmer is never easy, it requires tireless dedication, passion and a love for animals. Yeah, you may wonder on that since they do eventually meet an end at slaughter but small family farms take care to ensure that their pigs are living their best lives. The pigs at Bear and the Flower Farm have over 100 acres of green pasture land to graze on where they sped time playing in the water and sunbathing. The phrase ‘happier than a pig in mud’ comes to mind. Christopher of Bear and the Flower Farm giving ‘Donkey’ some love. It’s sounds so simple and idyllic but there’s so much more to raising heritage breed pigs. Significant attention to genetics, breeding, and environment results in the some of the best tasting, nutritious pork that can be produced. The pigs are fed a proprietary feed blend created by Bear and the Flower Farm that naturally enriches their pork with over 3 times the amount of Omega-3 unsaturated fats required for certification. 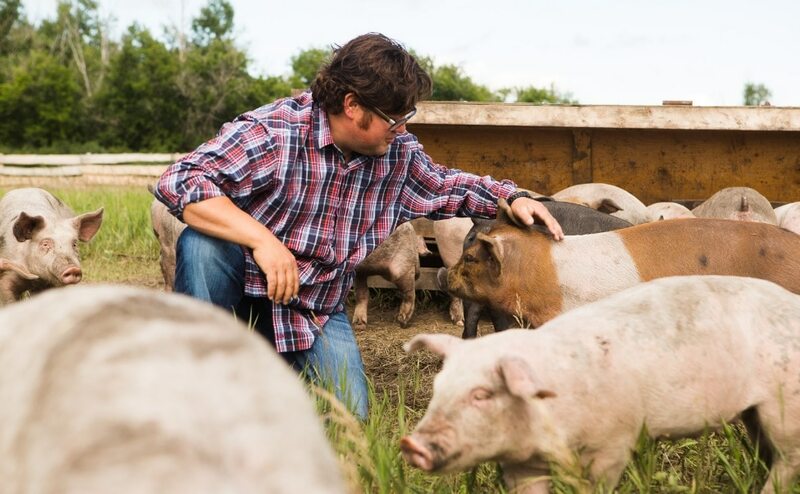 When you’re buying heritage breed pork, you’re not only supporting a local farming family but you are ensuring the diversity of the species and supporting ethically raised Alberta Pork and that is a win-win for everyone. Bear and the Flower Farm was just one of the five amazing Heritage Breed farmers that provided pork for the event, there was also Malorie Aubé of Country Accent Mangalitsa who provided the winning chef’s pig, Mark lahoda and Antonio Matriz of Sunhaven Farms, Allen and Joanne Vanden of Broek Pork Acres, and Danny and Shannon Ruzicka of Nature’s Green Acres. 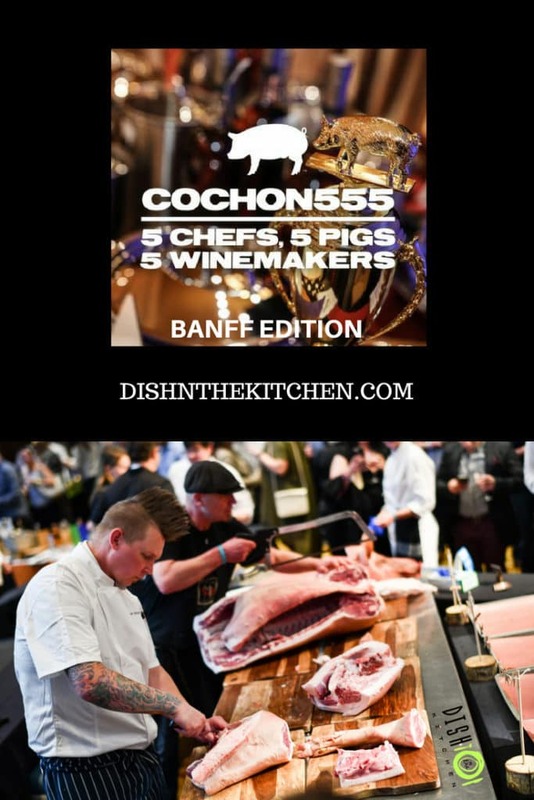 Cochon555 is first and foremost a celebration of Heritage Breed Pigs with the primary goal to raise the bar on building a sustainable and profitable relationship for brands and chefs participating in culinary festivals. By shining a light on this niche industry, the event is able to educate a wider audience that may have never known about Heritage Breeds otherwise. 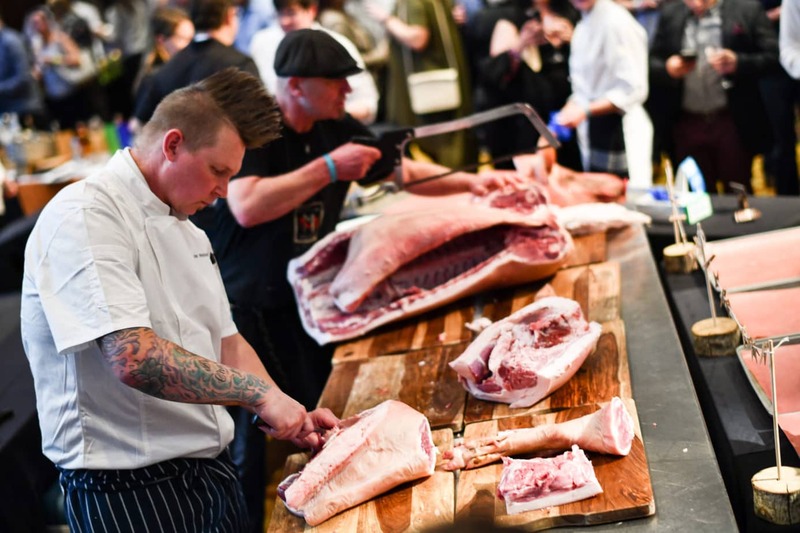 Who wouldn’t want to attend a food event promising 1500 pounds of pork?! Add to that, some outstanding local chefs (some celebrities in their own right), great wines and locally produced spirits…it’s not a hard sell. Nose to Tail use of the pig. 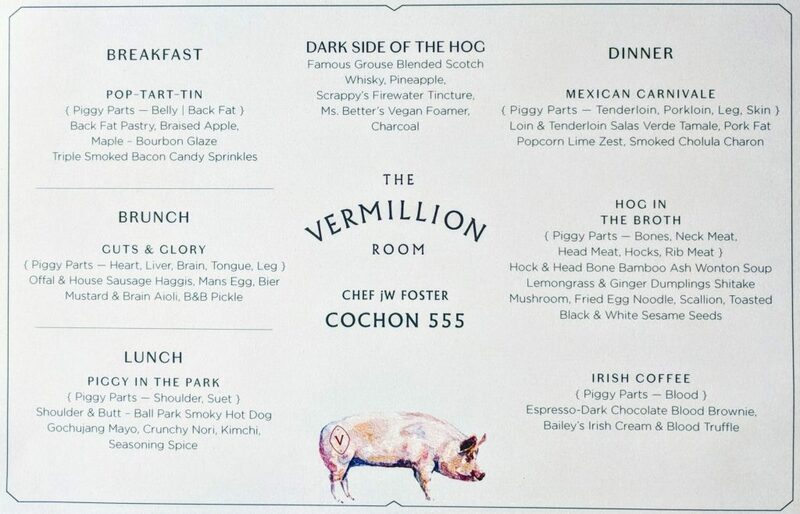 I was well aware that this was a nose to tail competition and that the chefs were challenged to use all the parts of the pigs but never did I ever think that I would eat EVERYTHING. Though I do enjoy the offal bits such as tongue, marrow, heart and skin…I never really had the urge to try anything blood or brain related. Turns out, I ate two separate dishes that contained these parts…and they were my very favourite dishes of the night. 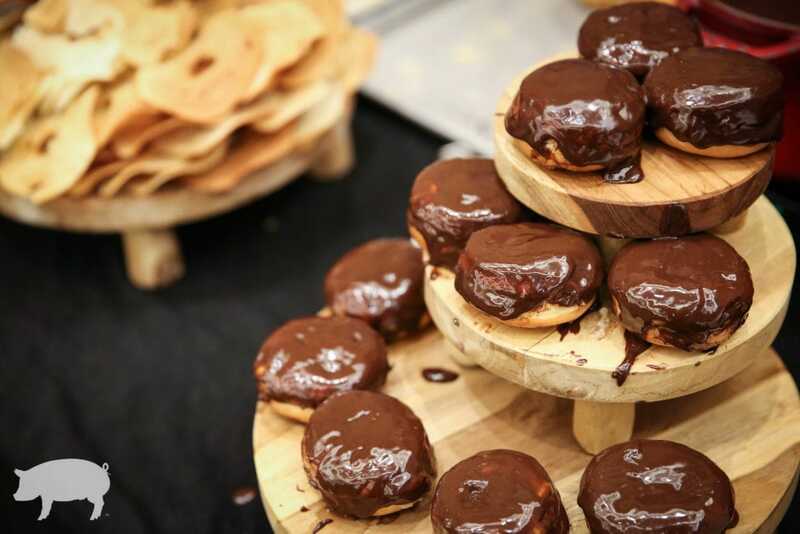 Connie and John’s Boston Cream Doughnuts with lard pastry cream and Blood Chocolate Ganache were such a unique treat! 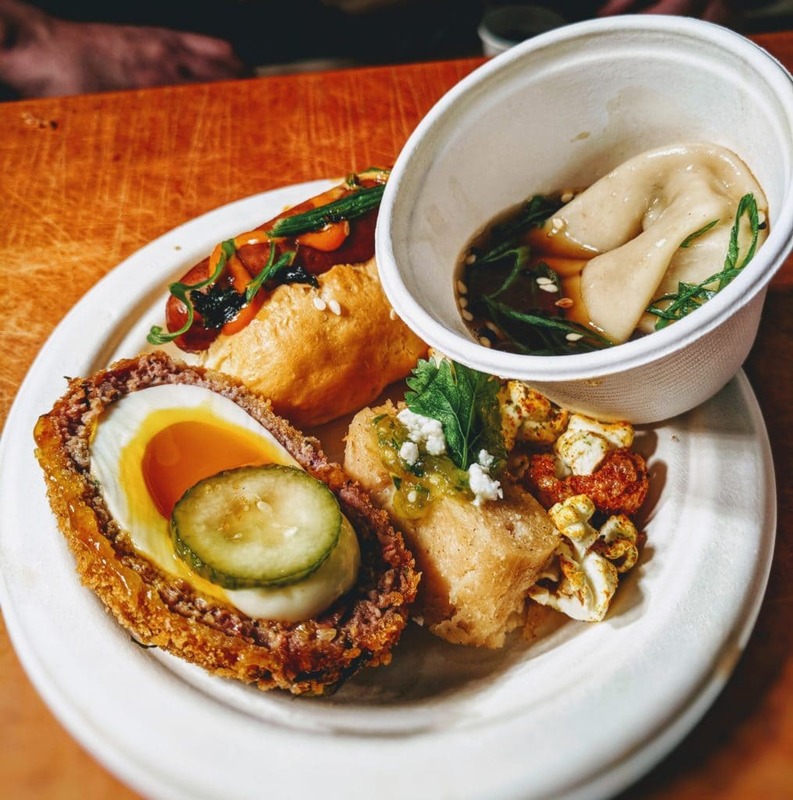 Most of the components of Chef JW Foster’s entry…including the amazing Scotch Egg that contained brain. So besides the well fed crowd, Punch Kings winner (Peter Walters from Park Distillery), SOMM Smackdown winner (Jackie Cooke from Avec Bistro & Provisions), Cochon555’s charity (The Piggy Bank), the ultimate winner is…the Prince of Pork who will move on to the Grand Cochon in Chicago on September 30. 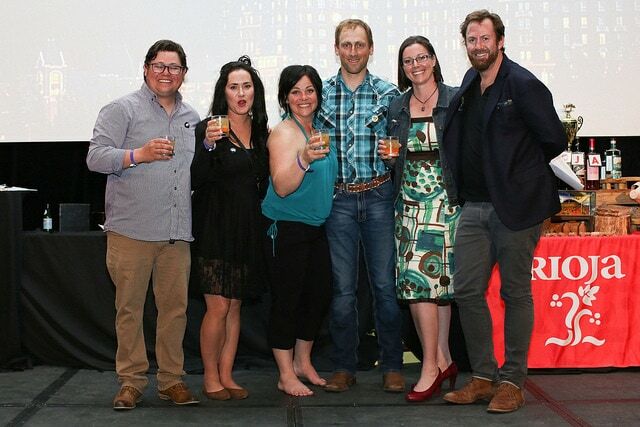 Congratulations to Chef JW Foster and his home team from the Fairmont Banff Springs Hotel! Not only did they create stunning dishes using all the piggy parts but they also served every one of them to the public in an efficient manner. It was the only plate of food that I ate in it’s entirety! This is a great post, Bernice. As a sometimes carnivore, I need to know how my food is raised, and it’s important to know that it”s humanely raised, how the animals are treated, and fed. Supporting farm families is also a cause close to my heart. Thank you for sharing this take on farming that many people don’t get to see. Agree completely. We’re reaching a point where sustainability is an issue. Our environment can’t support huge resource hogging ‘farms’ for much longer. 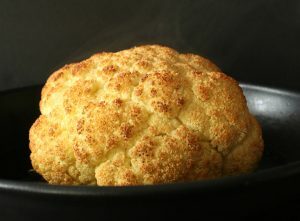 I really support a plant based diet with the occasional meaty indulgence. I would never be vegetarian but I do see a benefit to eating less (but better quality) meat. HA! I think knowing after is better. Then your brain doesn’t freak you out before trying something that could very well be delicious! What a great experience you had! Thanks for reminding us all of the importance of supporting our local farmers who are working to raise animals humanely and produce ethically raised meats. Definitely food for thought, right Elaine? Wow… what insights into the dedication of farmers to their breeds and husbandry techniques. We will have to root (no pun intended!) for Canada in the Chicago finals! Coming from the countryside, I totally get the quality and the benefits of sustainable meat! The menu looks quite interesting and delicious! Did you get to try all the dishes? I know that not everyone can afford it, but I think if we begin to change our perception of needing meet at every meal we can begin to focus more on quality over quantity. Unfortunately there were so many dishes and so little time! I did try every offering from the winning team though and I definitely think they deserved the win. Wow, now I can’t get that delicious menu out of my head haha! My grandparents used to own a small farm when I was little, so I am very familiar with “pig head to toe” concept 🙂 Some of my favorites are cured pork fat, blood sausage and terrine, which was made out of pig’s head. Thank you for sharing your experience from this event and what a great remainder of the local farms importancy. You know what’s strange? I grew up on a cattle farm and we never did any nose to tail eating! To this day it makes me wonder. I think I’ll ask my family why. Not even a tongue and I love tongue!